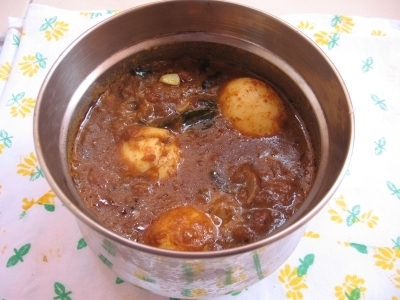 Chettinad Muttai Masala Recipe is a flavourful egg curry which is very different from the other egg masala recipes. South Indian style egg curry. Boil Egg for 5 mins. Then remove the shells. Peel and semi grind the Small onion. Heat Oil in a pan. Add Mustard seeds and Urad dal fry till it splutters. Add Curry leaves,Ginger and Garlic paste and fry for a min. Then add Onion and fry till it becomes light brown in color. Add Tomato and fry till it turn into soft. Then add Chili powder,Coriander powder, Chicken powderand Turmeric powder fry till raw smell goes. Once the raw smell goes add a cup of Water and Salt. Finally add boiled Eggs. Let the curry boil once.